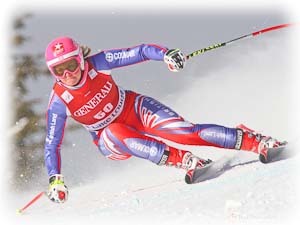 As Britains Number One Skier, Chemmy stays on top of her fitness at all times. Here she shares some of her favourite Exercises, and other tips for ski fitness. We illustrate a range of Exercises, including an extensive warm-up, exercises you can do at home and variations you can add at the gym. Follow the links to view various Ski Fitness Warmup exercises. Coming soon :- effective and efficient exercises that will raise your level of ski fitness, without leaving home! Coming soon :- additional gym exercises to further improve your ski fitness. Please Note :- Chemmy is not a qualified trainer or coach, and we offer this information only from her viewpoint, ability and experience as an Olympic athlete. Should you choose to follow the advice on this page, you do so entirely at your own risk. This information does not constitute medical advice or the practice of medicine, and it does not replace the advice of your doctor. Before undertaking any course of exercise, you (the reader) must seek the advice of your doctor, physician or other qualified health care professional. ALWAYS :- Consult your doctor before starting any fitness programme. ALWAYS :- Warm Up before exercising, and gradually increase range and speed of movement. ALWAYS :- Stop and seek advice if you feel unwell or experience pain or nausea while exercising.